Students participating in the MCCC/RWJ MedX Academy will have access to the college's state-of-the-art medical technology facilities. WEST WINDSOR – HIgh school students aspiring to careers in the healthcare professions will have a hands-on opportunity through a unique program offered by Mercer County Community College (MCCC), in collaboration with Robert Wood Johnson (RWJ) University Hospital Hamilton. 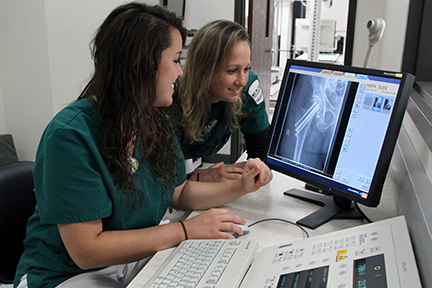 High school juniors and seniors interested in careers as physicians, nurses, and physical therapists and other specialized healthcare fields will gain a personalized view into the medical professions through MCCC’s new Summer MedX Academy. The program runs Aug. 7 to 25 from 9 a.m. to 4 p.m. Students who complete the three-week session and successfully pass a review test are eligible to receive three college credits from MCCC in Medical Terminology. This unique experience is comprised of live seminars and hands-on learning in MCCC’s state-of-the-art simulation labs, in addition to day trips to RWJ. Students will hear about real-life experiences from area doctors, nurses, physical therapists, college professors and other healthcare professionals. Dr. Robert J. Schreyer, MCCC Dean of Health Professions, said the MedX Academy offers a new perspective to area high school students with an interest in healthcare careers. The MedX Academy was created to provide a college preparatory experience to high school students seeking a career based in healthcare. For more information and to register, visit www.mccc.edu/medx.